Photo courtesy of Alabama State Port Authority. 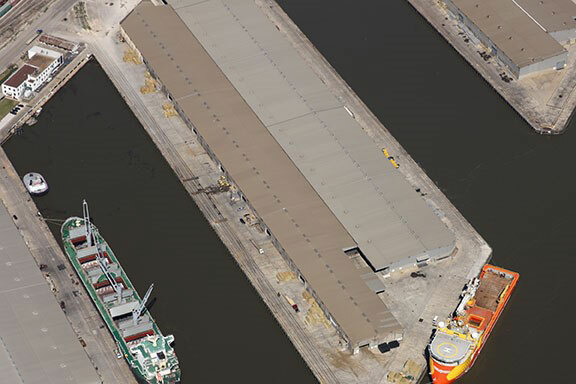 Mott MacDonald selected for pier rehabilitation in Mobile, Ala.
Iselin, N.J. — The Alabama State Port Authority (ASPA) selected Mott MacDonald to provide project management, engineering design, cost estimating, permit application preparation, and construction administration and inspection services for the rehabilitation of Pier B in Mobile, Ala. The rehabilitation of the 91-year-old pier will increase import and export capacity, supporting economic development initiatives in the city. ASPA supports 134,608 direct and indirect jobs in Alabama, with an impact of $22.4 billion in economic value. The project entails upgrading and updating a segment of the pile-supported reinforced concrete pier, which was built in 1927. The segment measures 70 by 1,500 feet. Options for the project include potentially increasing the structural capacity of the pier from 1,000 to 1,500 pounds per square foot.